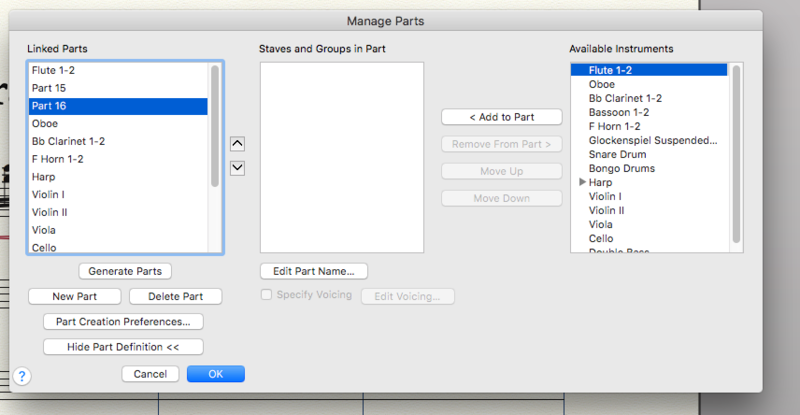 In a recent article, we talked about the basic features of Linked Parts. 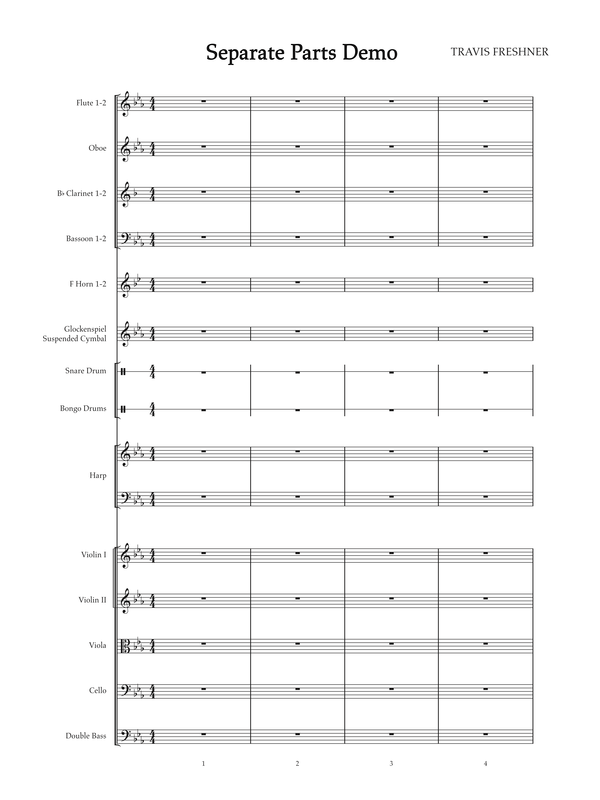 share a staff in the full score, such as Flute 1 and Flute 2. Start with your Full Score. For the sake of this demo, we'll just work with the Flute parts. The process will be the same for all instruments. Enter both flute parts on the "Flute 1-2" staff. enter both parts in Layer 1 (so they will share stems/beams). When Flute 1 and Flute 2 have rhythmically independent parts, you will split them into layers. (Resist the tempting urge to have both parts ALWAYS split between layers. 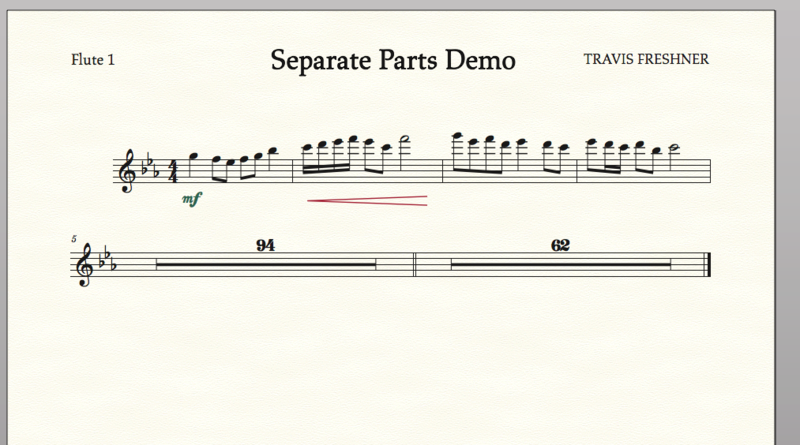 Doing this will make your score messier and honestly will not make any difference whatsoever with your parts). Now, do this for the remainder of the piece. For this example, I'm going to stop here with four measures, just to demonstrate the procedure. Also add dynamics and phrase markings, as usual, to the combined Flute 1-2 staff in the score. Now is where it gets fun. Click "New Part" twice. Two new parts will appear below Flute 1-2. In my example, they are called Part 15 and Part 16. 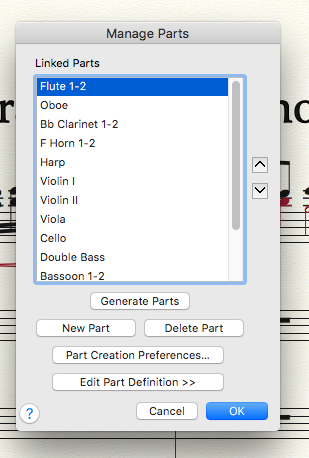 Select the first new part (Part 15) and then click "Edit Part Name" and rename this Flute 1. 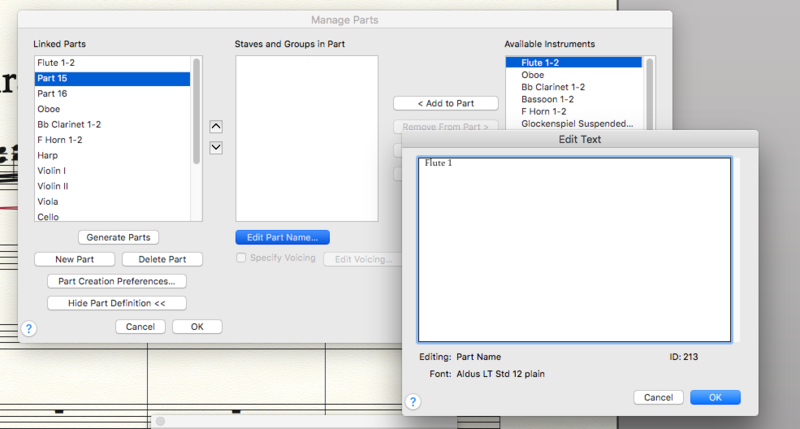 Now, with "Flute 1" highlighted on the left under "Linked Parts," look to the list of Available Instruments on the right. 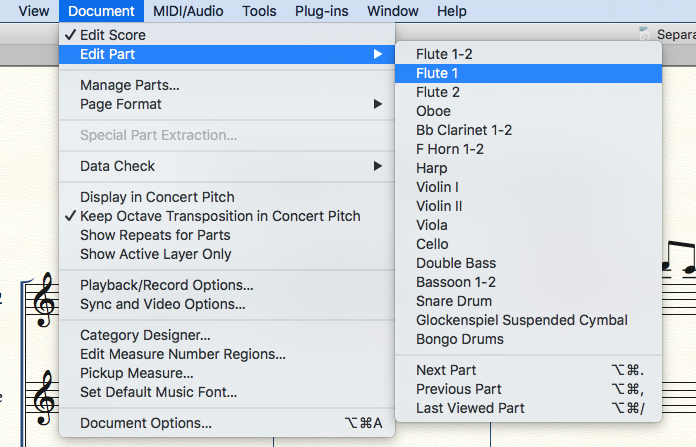 Highlight "Flute 1-2" and then click "< Add to Part"
"Flute 1-2" will move from the list of "Available Instruments" to the middle list, the one labeled "Staves and Groups in Part." 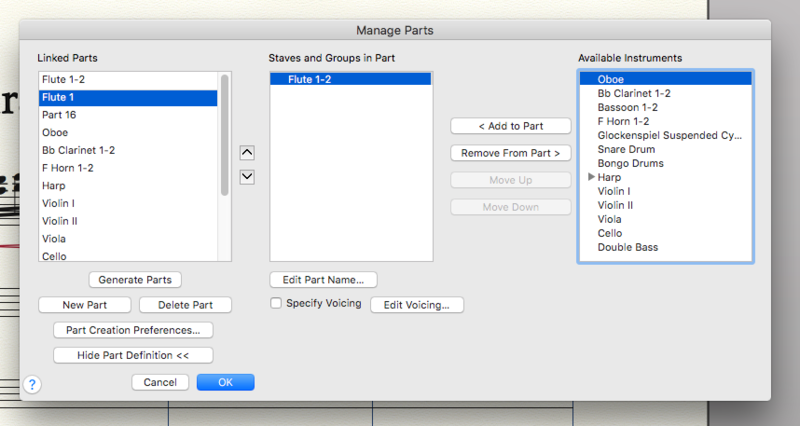 Now click the button marked "Edit Voicing" and the Voicing Dialog Box will open. Select exactly the following settings as shown in the pic below. 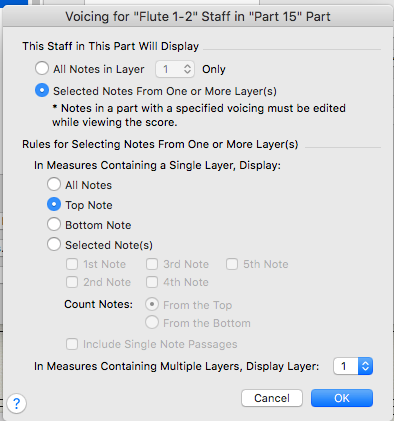 This will select the top voice when both parts are in Layer 1 and just Layer 1 when there are multiple layers (which is the Flute 1 part). Now repeat the exact same process for the 2nd new part (Part 16 for me) but rename this one Flute 2. 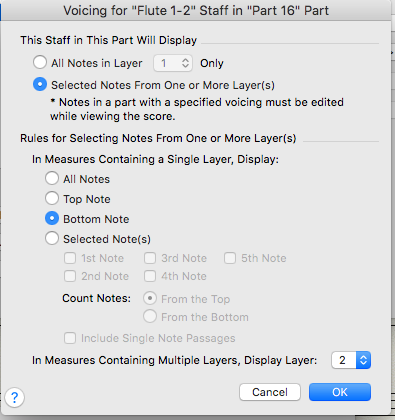 When you Edit Voicing, select THESE settings, which will give you the bottom note when both parts are in layer 1, and just Layer 2 when both layers are in use. (which is the Flute 2 part). Click OK and return to your score. Notice that below the original Flute 1-2 part are the new Flute 1 and Flute 2 parts. There is one little tricky quirk, though, that you need to know about. 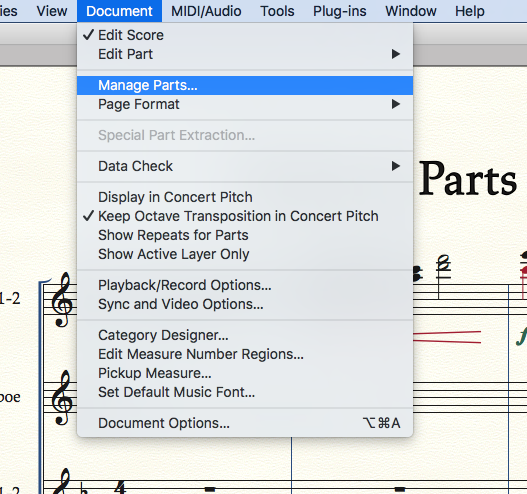 When you have split parts like this, you cannot edit them like you normally can edit Linked Parts (where any edits you make in the parts are automatically reflected in the score). You can move dynamics and expressions, of course, but you cannot change any notes or rhythms. If you need to make any changes to notes or rhythms in either one of the parts, you'll need to go to the score and edit them there, or you can also edit them in the combined Flute 1-2 part (but I'd usually just recommend editing them in the score). I hope you found this article useful. If you did, please share it with your friends and colleagues, and consider signing up for our email newsletter. It's a very low-profile email newsletter, only going out once ever 6 weeks or so. It's very unannoying and unobtrusive.